The debate in Japanese aviation over the future of bankrupt Skymark Airlines is as unusual as it is unpleasant – and perhaps ultimately uncontrollable. Skymark’s largest creditor, lessor Intrepid, is publicly opposing Skymark's selection of All Nippon Airways to sponsor it out of bankruptcy. ANA has no plans to use the A330s that Skymark leased from Intrepid and CIT; the aircraft are in a highly customised configuration that other airlines do not want. Nor is ANA interested in Skymark’s order for A380s, two of which have been assembled and represent the debt held by Skymark’s two other main creditors, Airbus and Rolls-Royce. Collectively these four parties account for 96% of Skymark’s debt, well above the majority position needed to vote on a restructuring plan. The Japanese government finds itself lacking control after decades of actively orchestrating aviation policy. Another wrinkle: the investor Intrepid proposes for Skymark is Delta Air Lines, which has publicly – and rudely in the Japanese context – denounced Tokyo over Haneda airport liberalisation. For Delta, Skymark could help it start to win the Japan battle – but perhaps lose the Asia war. Delta wants a joint venture with Korean Air, which is not convinced of the benefits. Korean Air is also sceptical of and sometimes disgruntled by Delta’s flip-flopping commitment to having a hub in Japan versus Korea. Delta’s push for Skymark is not as significant as its campaign a few years ago to woo Japan Airlines, but it will certainly do nothing to improve the Korean Air relationship. As is often the case in airline equity stakes, the value of an airline is not just in physical assets. The major attraction to Skymark is that it is the third largest holder of domestic slots at Tokyo Haneda, Japan’s prized airport, with 36 daily pairs. It is third largest by some distance – 7%, while ANA and JAL each hold over a third – but Haneda is constrained. New slots are some years away, but even then would be expected to be distributed with some regards to current proportions. What is different from other slot-driven transactions is that airlines in Japan do not own their slots; the government does. This is often the case in Asia, unlike in other markets, such as British Airways/IAG’s acquisition of bmi almost entirely for the latter’s Heathrow slots. Foreign ownership restrictions naturally apply to Skymark, but Tokyo has a separate airline ownership cap (20%) that, if surpassed, could lead Tokyo to redistribute Skymark’s slots. The discussion over whether equity comes from ANA or Delta ultimately comes down to this minority position, but is understood there will be significant influence applied on the outcome, even if through unofficial channels. ANA has sought to convey the benefit of its proposal for Skymark, saying that “Skymark will decide fares, routes, and frequencies on their own, so their independence is assured”. This may be true on paper, but ANA’s investments in other ailing Japanese airlines suggest ANA's gentle influence, at the very least, through management secondments and happenstance route changes: an ANA partner airline typically reduces capacity on route A and adds capacity on route B, and this is followed by ANA adding capacity on route A and reducing on route B. This is the first time there has been such a tussle over one of Japan’s “new entrant” airlines, which were supported by Tokyo to break up the ANA-JAL monopoly but ultimately have failed as independent carriers; the outcome us usually that they receive varying levels of support from incumbents, mostly ANA. The possible entry of a foreign party is because of Skymark’s creditors wanting a solution that ANA is unwilling to provide. Rival Japan Airlines would be more than happy to sponsor Skymark and improve its Haneda position relative to ANA. ANA's Haneda slot portfolio is boosted when including the smaller airlines it has taken stakes in and can effectively utilise their Haneda slots. JAL however is unable to invest in Skymark: JAL's 2010 restructuring came with terms that prevent investments. JAL was quick to publicly state it would not invest in Skymark. Privately, it sighs over how good an opportunity Skymark is. Skymark’s creditors exist because of Skymark’s relatively rapid fleet growth involving all-new widebodies with bespoke interiors. Past “new entrants” had little in the way of aircraft assets: aircraft were old or were narrowbodies in a common configuration that could be placed elsewhere if that became necessary. As CAPA previously noted, the problems with Skymark’s A330s and A380s – which are the source of creditors’ debt – have a unique status. Two A380s have been assembled and while they do not have interiors, there are structural components to the Skymark A380s that would likely have to be changed to support any new interior. And of course the A380 itself is unique, with only a few operators. 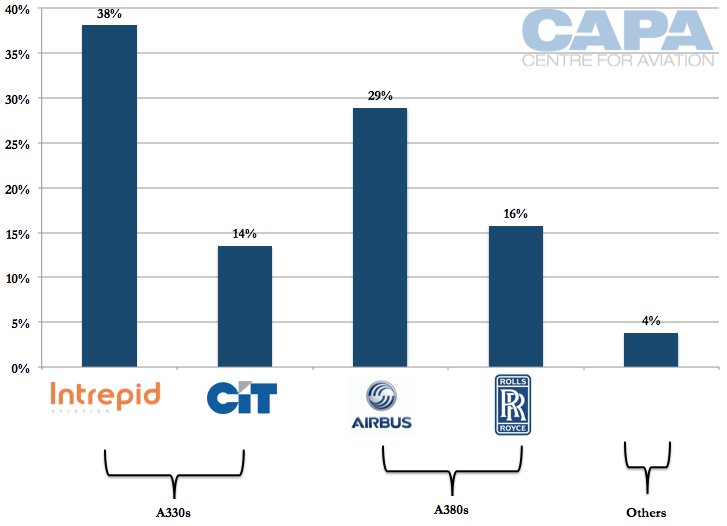 Unlike the A380, the A330 is far more common and in relatively high demand. Skymark’s aircraft are at most 18 months old. But Skymark put the aircraft in a controversial all-premium economy configuration that no other airline has wanted. Many airlines have deemed retrofit costs for the A330s to be prohibitively expensive. Japanese investment firm Integral is leading Skymark’s rehabilitation. When Integral announced ANA as the sponsor of Skymark, there were talks between ANA and Intrepid under which ANA would take Skymark’s A330s and gain Intrepid’s blessing for ANA’s involvement in Skymark. CIT’s involvement is unknown, while ANA’s interest in the A380s is unclear. Officially ANA denied there should be any connection between assisting Skymark and taking its A330s, but the connotation is obvious. Along the way it appears the talks between ANA and Intrepid broke down, leading Intrepid to look for a new sponsor for Skymark that would presumably offer a solution to placing the aircraft. Intrepid has done this against the wishes of Integral, which maintains that ANA is the best option for Skymark. Intrepid has played the card that Delta sponsorship instead of ANA would allow Skymark to retain independence and be the “third force” in Japanese aviation, employing the "third force" or "third arrow" term familiar in Japanese aviation. Skymark’s other three main creditors have been distinctly quiet in the public limelight. Their exact involvement with Intrepid is unclear. This is perhaps characteristic for Rolls-Royce, which is generally reticent about public statements, as it was for example after one of its Trent 900 engines suffered an uncontained failure on Qantas A380 flight QF32. Airbus also is sensitive about the Skymark situation because of its position in Japan and the A380 programme. Skymark’s A330 and A380 deal was something of a breakthrough for Airbus in Boeing-dominated Japan. Despite JAL’s A350 purchase, the quick downfall of Skymark and its Airbus widebodies is a significant symbolic setback. Meanwhile Airbus is extremely sensitive about the A380 programme and does not want the aircraft to be known as being party to an airline going bankrupt. 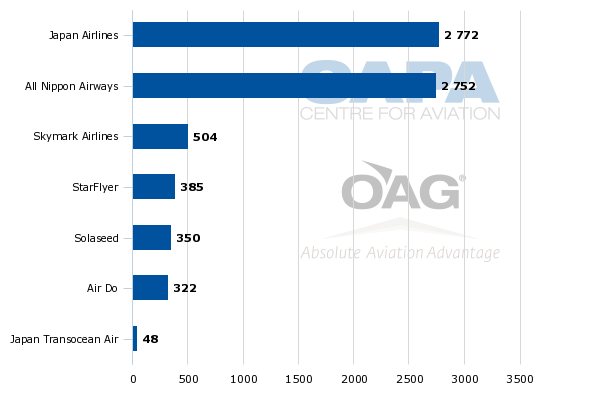 As CAPA has previously noted, Skymark’s larger problems were with domestic over-capacity brought on by the A330s and this was then compounded by the A380s. But most news reports simply name the A380. It is unclear just what Delta has offered to Intrepid to have Intrepid name it as a sponsor. The expansionary HNA Group was reportedly interested while Nikkei reported that Intrepid had approached Qantas – although it is understood Intrepid put out feelers to most airlines. Intrepid has said Delta will not directly take Skymark's A330s. Intrepid said that if its Delta-supported plan is accepted it would voluntarily withdraw JPY30 billion (USD242 million) of its JPY115 (USD927 million) claim. Intrepid believes that would free at least JPY1.5 billion (USD12.1 million) to be repaid back to the creditors and bring the repayment rate up from 5.0% to 5.5%. Intrepid's previous low repayment rate plan has been criticised by ANA and Integral. Mr Anderson has also disputed the A380's selling point of offering concentrated capacity on thick routes, saying he believes the market wants high frequency, which negates the A380's large capacity. “As a consumer do you want eight flights a day in every time channel? Or do you want two a day in two time channels where you take all four flights and pack them on an A380? It’s not what people want.” Delta has also negatively remarked on the impact of Air France's A380 on the trans-Atlantic JV, and was less than enthusiastic on the A380 order from Virgin Atlantic, in which it owns a stake. While Delta would be highly unlikely to take the A380s, this does not rule out Delta finding another arrangement with Airbus (and Rolls-Royce). Intrepid needs the backing of just one more major creditor to see its Delta plan approved. The creditors are due to choose between ANA or Intrepid's plans at a closed meeting on 05-Aug-2015. For Delta, Skymark presents opportunities but is not quite the saviour some have made the deal out to be. Delta is the only one of the US “Big 3” lacking a joint venture partner for Asia: both American Airlines and United are with Japanese carriers, JAL and ANA respectively. These arrangements cover the large US-Japan market but also help with connections beyond (where permitted by regulators – China is a holdout). Delta would gain access to Skymark’s domestic position. But there are several qualifications. Under current regulations, Skymark cannot transfer its domestic Haneda slots to Delta for any service, international or domestic cabotage. The former would be very appealing, the latter not. Delta would be taking a long term view that Skymark in the future will have a better slot portfolio, and that Delta will have better access to Haneda, allowing it to better utilise its potential partner's flights for connections. In Tokyo, Skymark only flies from Haneda, whereas Delta has all but one of its flights at Narita (excluding soon-to-be-discontinued Seattle-Haneda). The distance between the two airports makes transfers largely impractical because of time (a one hour bus ride or more) and logistics (claiming checked luggage, transferring it to the other airport, checking it back in). Nonetheless Haneda-Narita transfers are not impossible and certainly already occur at other airlines. Delta’s remaining Haneda service has a late night arrival, restricting two-way connectivity. There are two daytime Haneda-US slots to be allocated to US carriers (these could support two-way connectivity and overall would be more valuable than night slots), but Delta would be unlikely to receive both slots. Delta has services to points besides Tokyo in Japan. In Jul-2015 this includes five times weekly Honolulu-Fukuoka, daily Honolulu-Osaka Kansai and five weekly each from Detroit and Honolulu to Nagoya. Skymark could provide rather limited connectivity from Fukuoka and Nagoya, but none from Osaka Kansai since Skymark does not serve Kansai. Delta has fifth freedom rights from Japan to Bangkok, Manila, Shanghai Pudong, Singapore and Taipei. From Japan, Delta serves the leisure markets of Guam, Palau and Saipan. Delta could have worked more closely with Skymark without investing equity. But the prospect of ANA taking an equity stake in Skymark effectively shuts Delta out unless it also takes a stake. Delta and Skymark had a limited partnership in which Delta’s Japan-based frequent flyers could redeem Delta miles for travel on Skymark. This was a solution for local travel for Delta's Japanese frequent flyers, who make up the largest customer base outside the US. 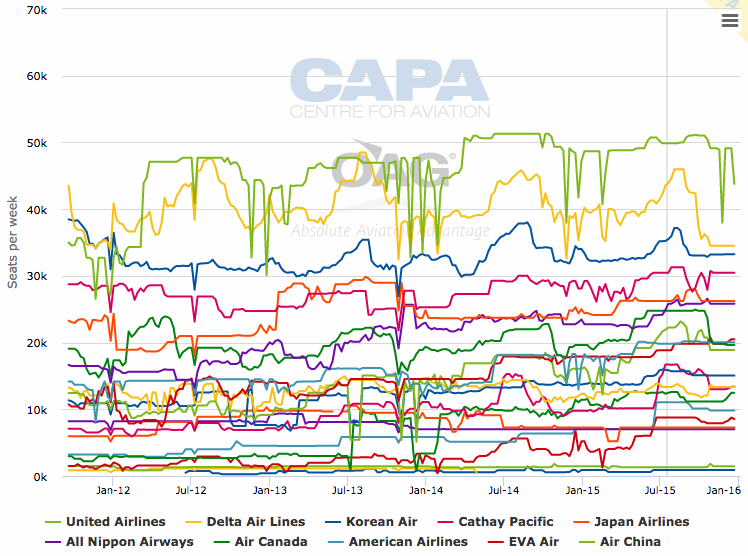 Prior to Skymark’s bankruptcy, CAPA saw that Skymark needed to engage with partners and make other changes to give it greater relevance, such as by having a loyalty programme to woo passengers from ANA and JAL. Skymark’s IT could not even support interlines. Among Delta's very limited comments about its plan for Skymark is that it would help create a loyalty programme and improve IT. Delta also believes its experience can help improve Skymark's revenue management (which comes off a low base given the relatively low level of sophistication of revenue management in the domestic Japanese market). Publicly and aggressively denouncing regulatory affairs can be the norm in some markets, but not Japan. Delta in 2013 held a press conference in Japan calling for Tokyo to give Delta back the Haneda slots it used (via merger partner Northwest) before moving from Haneda to Narita in 1976. Delta wanted to move its Tokyo hub back to Haneda, which all told would have required 25 daytime slots – a completely unlikely sum. Even publicly lobbying for one slot would have raised eyebrows, but to argue stridently for two dozen did not wash well. Tokyo in 2014 allocated 42 daytime slots for international services around the world. Now here was a single airline serving a single market demanding more than half of the pool. See related report: Delta Air Lines seeks a Tokyo Haneda base. Skymark a potential partner, to shake up alliances? Delta remains strongly opposed to any further changes to the Haneda operating rules unless and until Japan is willing to open the airport under normal open skies terms and allow Delta to relocate its Tokyo hub operation to the preferred airport. Any incremental or phased deal effective before then would be harmful and unfair to Delta as a Narita hub operator. Accordingly, we urge the U.S. government to aggressively pursue a full opening of Haneda to allow fair and equal access by U.S. carriers and their customers. Right or wrong this was most certainly not likely to generate a positive response in Tokyo. Delta wants a trans-Pacific joint venture with Korean Air and has engaged in serious competitive tactics to effectively force Korean Air into a deal. It is understood that Delta’s challenge is that the very top level of Korean Air management remains unconvinced that Delta is a necessary partner. Some in Korean Air favour a Delta JV, but the defining view appears to be that Korean Air is larger across the Pacific, has the numerous beyond gateways, is perceived to have a better product and ultimately does not need to share with Delta. Whether or not Delta agrees on those points, if it wishes to win Korean Air over it should be on a charm offensive that its future in Asia is with Korean Air and with Seoul. Korean Air still remembers when Delta unsuccessfully wooed Japan Airlines to be its partner and join SkyTeam instead of working with oneworld carriers (the eventual outcome). During that time, it appeared Delta had cast aside the interests of its existing SkyTeam partner a short distance away in Korea. Seoul Incheon Airport has publicly stated it has offered to help Delta move its Asian hub to Seoul. While Delta has not agreed to the deal, it was polite and did not rule the prospect out. But now Delta’s interest in Skymark is likely to rock the boat, even if Skymark does not fly across the Pacific or to other points in Asia. The overlap between Korean Air and Skymark is small; Korean Air could help Delta access other Japanese points over Incheon instead of Skymark’s (smaller) network. The feeling at Korean Air is that there is a lack of commitment from Delta, which could help explain why Delta has so far been silent on what exactly are its plans for Skymark, and implications for wider Asia. A combination of a Delta-Skymark partnership and Delta-Korean Air could be complementary. If Korean Air and Delta can strike a deal, Korean Air would surely want Delta to be fully committed and to flow Japanese traffic over Incheon. It appears that for the medium term Delta-Skymark network synergies will be very limited. The competitive threat to Korean Air is small. By itself, Delta’s interest in Skymark is probably not a concern to Korean Air. But against the broader contentions between Delta and Korean Air, Delta’s interest in Skymark is not helping. Korean Air has been forming partnerships with other North American carriers. This helps it gain leverage with Delta by showing there is another option for Korean Air to secure beyond gateway access. In a worst case scenario, this is plan B if talks with Delta are exhausted and Korean Air cannot partner with Delta. The partnerships – mainly with unaligned Alaska Airlines, JetBlue and WestJet – help Korean Air while the future of its Delta partnership is worked out. Beyond gateway access is less important for Korean Air than for other Asian carriers since Korean Air already serves 13 North American points; beyond traffic is in smaller but not insignificant volumes. One challenge for Korean Air is that historically Delta has not in any event had a major presence in many of the markets it operates to, meaning a less than optimal on-carriage potential. Outlook: a time for discretion, as Skymark takes centre stage. Are there any winners? Skymark’s situation is complex with no obvious winners. Not even the public may benefit: Skymark partnering with ANA could reduce effective competition. Independence for Skymark appears to have been ruled out. Dispersing Skymark’s Haneda slots among Japan’s new LCCs could bring substantial competition but is too radical a move. But it is surely waiting in the future as Peach begins international night operations from Haneda; daytime operations and domestic slots are natural evolutions with time. Tokyo has allowed foreign airline ownership in the past, but only at LCCs not based at sensitive Haneda. A stake from Delta may be perceived as a lesser threat than from a closer-to-home airline like AirAsia, but it is not ideal from a nationalist view. How much Tokyo can influence outcomes is unclear when foreign entitles hold 96% of Skymark’s debts. If Intrepid’s Delta solution is favoured, Tokyo may need to persuade ANA to re-evaluate Skymark’s aircraft. ANA has gained much support from the government – too much, JAL would say – and Tokyo might see that it is time for ANA to give back, making concessions to keep Skymark in Japanese control. Whatever Delta’s outcome with Skymark, merely expressing interest will necessitate smooth bedside manners with an unconvinced and likely upset Korean Air. But Delta is known more for being a hard and even combative negotiator. Meanwhile Skymark’s creditors need to weigh their current financial interest with potential future sales. Tokyo has a long history of encouraging Japanese airlines to select certain OEMs; JAL’s order for A350s was seen as rebellion since the government was supporting ANA instead. Much in this affair has been unsaid, so it is difficult to suggest likely solutions or how strongly parties should fight. This story has more chapters still to be written.